Traditional Blue Willow designs on porcelain teaware from China. Blue Willow teapot, 16 oz, with white china infuser (use a personal size Tea Quilt tea cozy for this teapot), 4 oz teacup (sold individually), and a tea tidy/saucer. Made in Japan. 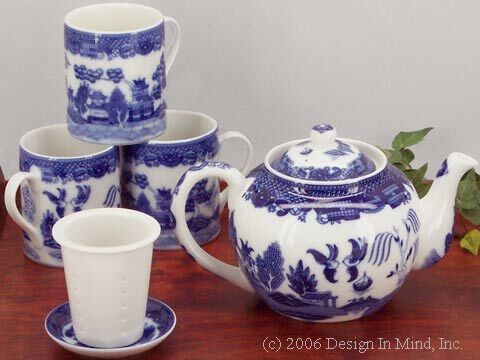 Blue Willow, a wonderful timeless china teaware pattern. 6 oz cups and saucers. Set of 4. 7.5" plates. Set of 4. Made in Japan. 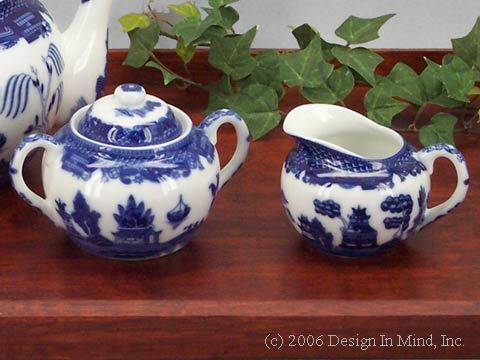 Blue Willow cream and sugar set. Shown with the 32 oz teapot (sold above). 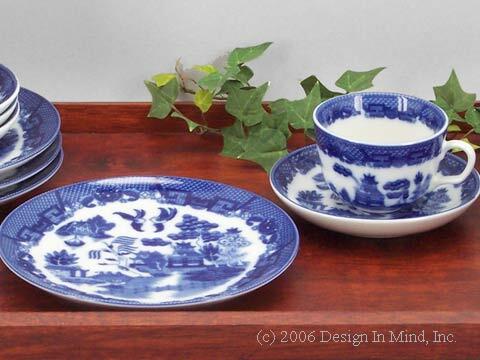 Enjoy this wonderful china teaware in the timeless Blue Willow pattern. Made in Japan. Blue Willow china teaware. A wonderful timeless pattern. In researching the history of the willow pattern we were pleased to find that these pieces feature the design elements of the true willow pattern: the bridge with three persons crossing it, the willow tree, the boat, the main teahouse, the two birds and the fence in the foreground of the garden. 32 oz teapot with white china infuser (use a standard size Tea Quilt tea cozy for this size teapot), 10 oz mug (sold individually or in a set of 4), and a tea tidy/tea saucer (to hold a used tea bag or teapot infuser, as shown). Made in Japan.